CPG & 1809 Starter Sold Out! 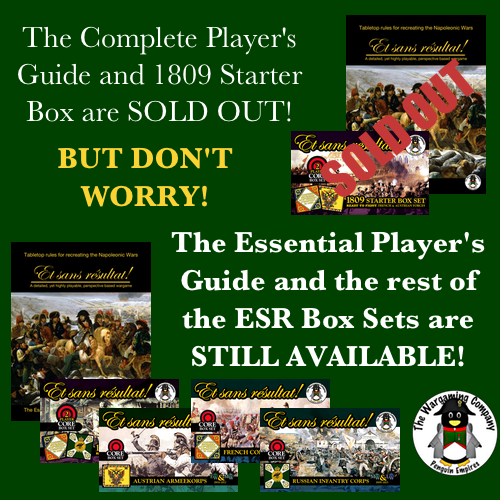 Demand has just soared ESR Second Edition since the introduction of our ESR Napoleonics Box Sets and while The Complete Player's Guide and 1809 Starter Box have sold out, DON'T WORRY! We still have The Essential Player's Guide and the rest of our ESR Napoleonics Box Sets available and most orders ship the same day they are placed! This entry was posted on Monday, April 2nd, 2018 at 16:56 and is filed under News. You can follow any responses to this entry through the RSS 2.0 feed. You can skip to the end and leave a response. Pinging is currently not allowed.